I am fascinated by felting. There are so many ways the process can be used as well. Typically I make felted sculptures with raw wool. 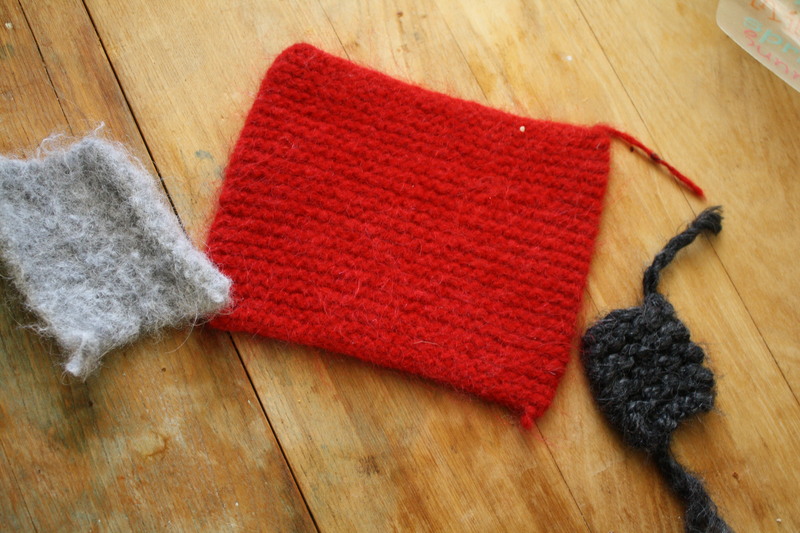 I have been intending to felt some knitted projects. I was unsure of the specifics of the process and how different fibers matte together so I knitted up some patches. The light gray is a hand spun 100% alpaca I found in a little herb shop here in Galena, The Great Galena Peddlery. The red is a 70% wool/30% mohair blend from Peace Fleece and the dark grey is actually a wool/acrylic blend that I did not expect would felt at all. I threw them all in the washer with dish soap, a hot wash, and a cold rinse. Then I put them in the dryer. I did the whole process twice and this is what happened. The alpaca felted beautifully. It is now a luxuriously soft swatch. I’ll have to figure out what to do with it. The acrylic blend of course did nothing. When you read in books about felting that acrylic doesn’t felt it is true. The red Peace Fleece swatch hardly did anything and washed it an extra time.I think it would felt if I kept washing it down, but three is my limit for using all the water it takes to run it through the washer. I think the swatch would make a good pot holder. I checked the Peace Fleece website to see if maybe the yarn was treated to be washable, but I couldn’t find anything. It seems to just be one of those yarns that takes a lot of coaxing. I could of course try to wash it down by hand or dry felt it with a felting needle. Hello again! I am feeling very bloggy. I realize it’s after Christmas, but knitting can take a long time and since I am (or was) inexperienced at knitting hats, it took a a while to finish the gifts for my parents. Now here they are and I am proud! They are actually not knit in the round. I’m not really a fan of wresting with double pointed needles or trying to find the right length circular needle. 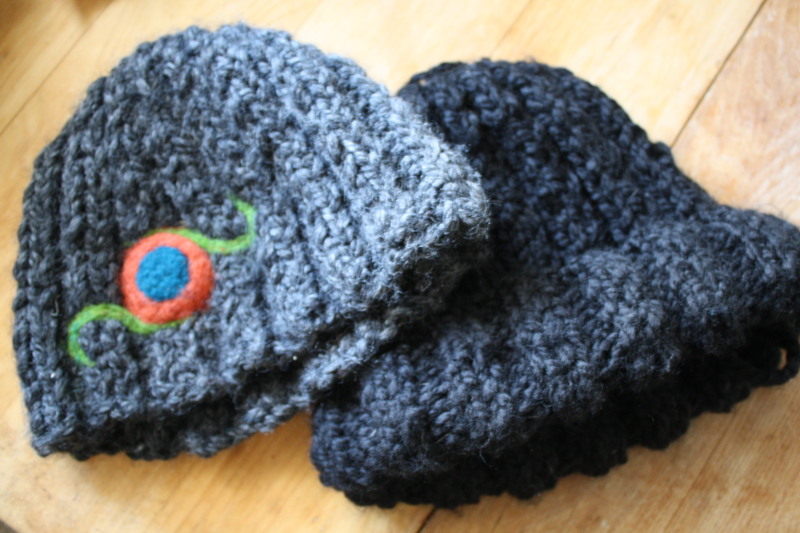 These hats are knit on size 15 straight needles. 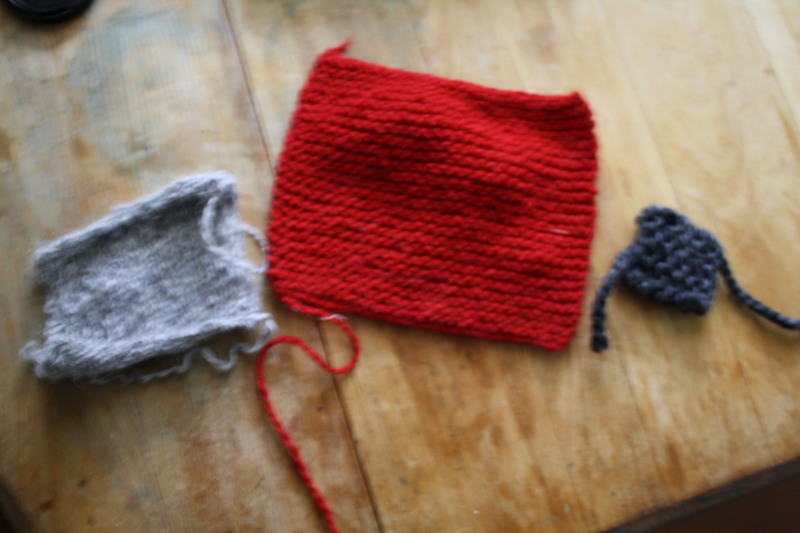 I started with 60 stitches in 2×2 rib stitch, knit 25 to 30 rows, then started decreases by knitting two together. 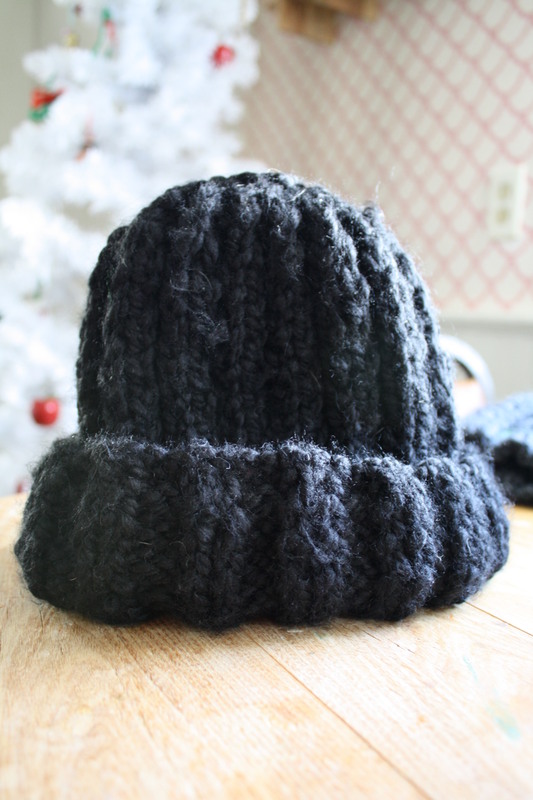 K2 P2 for 23 rows for a hat that does not fold or 30 rows for a hat that does fold or however big you want the hat. After row 30 make sure you are on the RS or the side that starts with the two knit stitches. If you are on the side that starts with 2 purl stitches, then knit/purl that row and start with the next row. Now you need to shape the crown. To do this you k2tog P2 until the end of of the row. Next row you will K2tog P1 until the end of row. Last row K2tog to end. Now what you want to do is cut a 20 inch tail and pull it through the remaining stitches, cinching them up. Sew up the seam with your tail and weave the ends in. Voila! How easy is that? If you sew up you seam nice and neat you won’t even notice it! 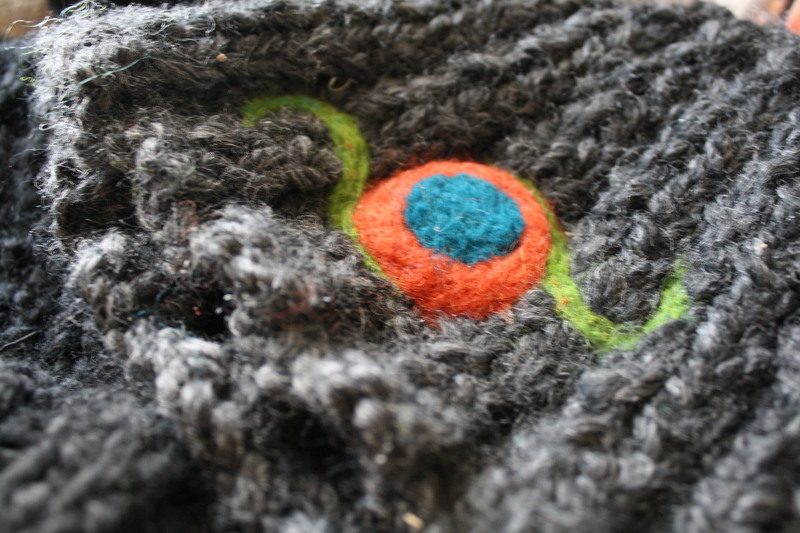 The flower design on the gray hat is done with needle felting. I appliqued it using wool roving and a special barbed needle. 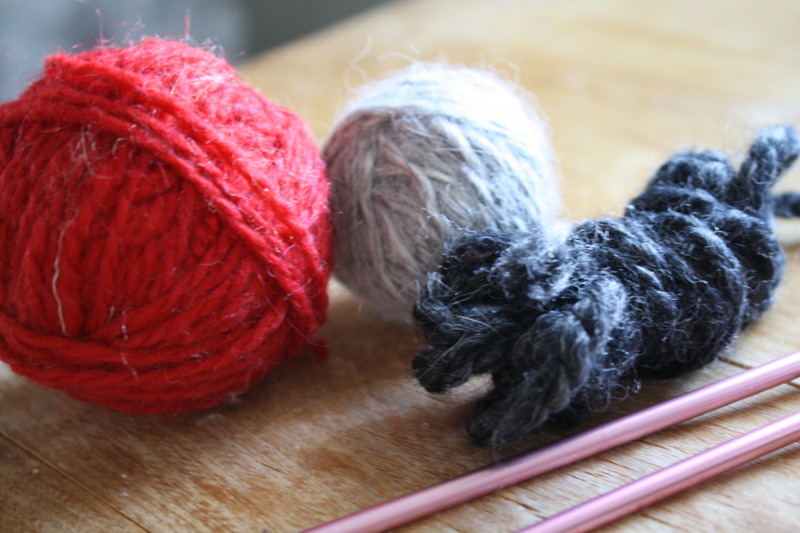 The fibers in the yarn and the roving matte together causing it to stick to the knitted fabric. This was the first time I appliqued to a knitted fabric and I’m thrilled about how it turned out. Oh and Happy New Year! Wishing you a fantastic year.